Before summer, Chris and I decided it's time to renovate our 1000 square feet home to make it more livable. You remember the heater was broken and our one and only bathroom was leaking a few days after we move in. We fixed the bath room but the heater was still broken. After some planning, calculating, and discussing, we decided it's better to renovate now than going through another winter without heater. So we packed our stuffs and move them to the garage while we moved in to our friends' house for 10 days then moved in to another friends' apartment the next month. Max finished first year of Chinese School last June. Can't thank God enough for this school, sweet friends, and loving teachers. Didi started biking two wheels last summer too, just a few months after he turned four. So we are now can bike on our own. Yayyy!!! We had been biking a few times with group of friends. The renovation start with getting rid of the popcorn ceiling, carpet, and dividing wall between the kitchen and living room. The kids started swimming lesson at the end of June and loving it. in summer style of course. It's been good to have the big boy back in the kitchen. He is usually in Chinese School when I cook dinner. Chris' sister and his family were visiting for a few days so we brought them to Tahoe. We were here when started off our relationship. So grateful to have this wonderful man to journey this life together these past 15 years. Max lost four of his baby teeth so far. He turned 7 this year. I wrote on the balloon our wishes and prayers and have him read them in the morning. He loves it so much that we still keep the balloon until now. 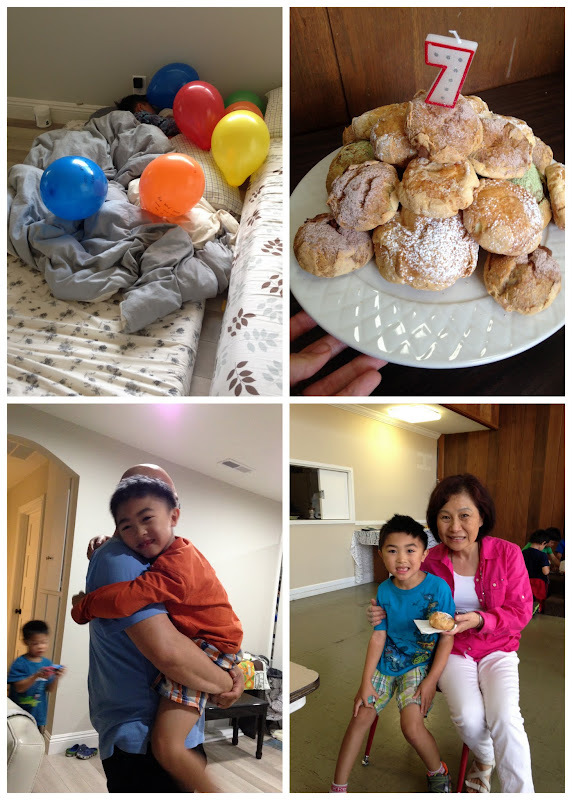 He never like cake so we opted for Beard Papa puffs instead. He passed his belt test and moved on to yellow belt. Well done, buddy! The theory test wasn't easy. He had to memorize a long description word by word, which took him two days, tears and frustration, countless words of encouragement, prayers, and inspiration stories of his grandpa who never say the word, "can't" and his God Grandma/ Bobo whose "can do" attitude made her decide to go to another mission trip at 76 years young. Before the test I was about to offer but he asked me first, "Ma, could you pray for me?" We did pray and he passed the test. Thank God! aawww so great to read all the updateS! !1 what is with 'magna tiles"...why so pricey??????!!!!! better than lego?